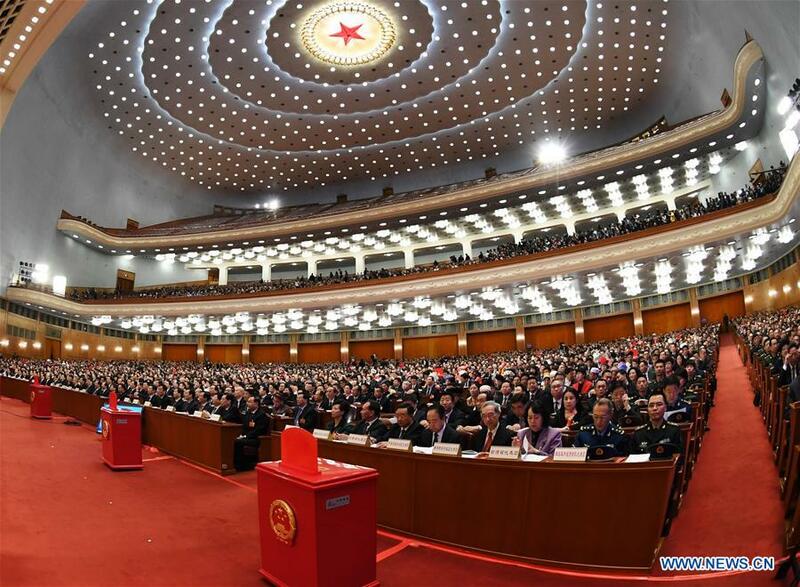 BEIJING, March 11 (Xinhua) -- China's National People's Congress (NPC), the national legislature, enshrined Xi Jinping Thought on Socialism with Chinese Characteristics for a New Era in the country's Constitution on Sunday, codifying its guiding role. The amendment, adopted at the first session of the 13th NPC with an overwhelming majority, wrote Xi's thought into the Constitution's preamble, along with other guiding theories including Marxism-Leninism, Mao Zedong Thought, Deng Xiaoping Theory, and the Theory of Three Represents. Scientific Outlook on Development has also been incorporated into the Constitution as a guiding theory. "As an important content of the amendment, the inclusion of Xi's thought into the country's fundamental law reflects the common aspiration of the entire Communist Party of China (CPC) and all Chinese people of various ethnic groups," said Shen Chunyao, chairman of the Commission for Legislative Affairs of the 12th NPC Standing Committee. "It has been the fundamental theoretical guide for the historic achievements and shifts made in the cause of the Party and the country since the 18th CPC National Congress," Shen said at a press conference held right after the amendment was adopted. The CPC announced the formation of Xi's thought for the first time at its 19th National Congress in October, hailing it as "the latest achievement in adapting Marxism to the Chinese context and an important component of the theoretical system of socialism with Chinese characteristics." Upon conclusion of the congress, Xi's thought was written into the Party's Constitution as a new guide to action. Key concepts, policies and strategies the Thought encompasses were embedded in the Constitution. Included are a vision of innovative, coordinated, green and open development for all; the five-sphere integrated plan for coordinated economic, political, cultural, social and ecological advancement; the goal of a "great modern socialist country"; and an oath of allegiance to the Constitution. The amendment has enriched clauses on the patriotic united front, harmonious relations among ethnic groups, and peaceful foreign policies, including the addition of building a community with a shared future for humanity. The expression that China will "adhere to the peaceful development path and the mutually beneficial strategy of opening-up" was added to the preamble. The following sentence was also added in the Constitution to stress the overall CPC leadership: "The leadership of the Communist Party of China is the defining feature of socialism with Chinese characteristics." "The greatest strength of the system of socialism with Chinese characteristics is the leadership of the CPC," said Cao Qingyao, an NPC deputy and a district Party chief of Chongqing Municipality. "The revision has enriched provisions concerning upholding and strengthening the overall CPC leadership and is significant to ensuring the Party and the country to forge ahead along the path of socialism with Chinese characteristics," Cao noted. Other revisions include adding core socialist values and granting Chinese cities, with subordinate districts, the power to make local laws and regulations. The people's congresses and their standing committees in these cities will be able to adopt local laws and regulations under the condition that they do not contradict the Constitution, national laws and regulations, and provincial laws and regulations, according to the amendment. A revision to a clause concerning the Chinese President and Vice President's terms of office was also incorporated. "It is a key measure to improve the state leadership system," Shen told the conference. Supervisory commissions have been listed as state organs in the Constitution, with a section about such organs added to the third chapter, "The Structure of the State." Supervisory organs are listed together with administrative, judicial and procuratorial organs of the State, all of which are created by the people's congresses to which they are responsible and by which they are supervised. Lawmakers at the session agreed that the constitutional revision, which accords with the aspiration of the Party and the people and has won approval from both inside and outside the Party, is of historic significance for ensuring prosperity and lasting security of both the Party and the country. The draft amendment was submitted to the first session of 13th NPC for deliberation among nearly 3,000 deputies on Monday. The amendment was put into effect Sunday. The most recent amendment in 2004 protected private property and human rights, and gave the Theory of Three Represents constitutional authority.